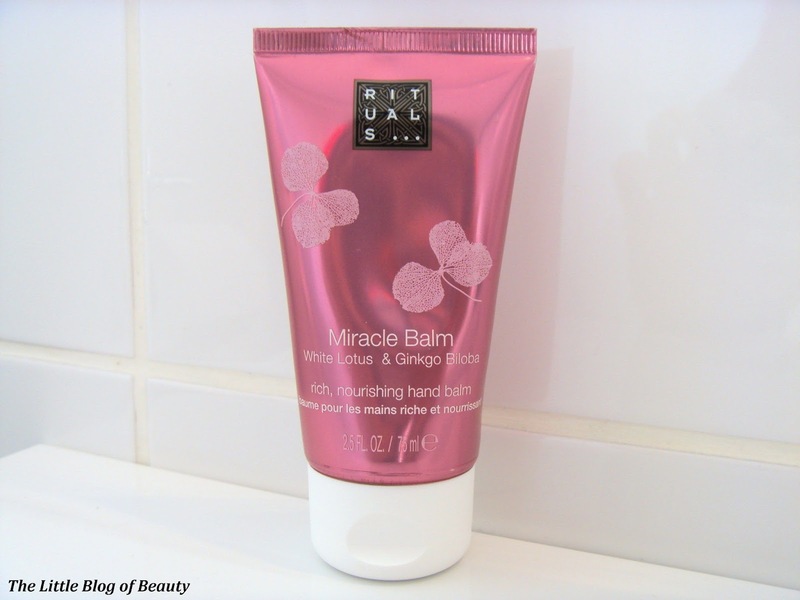 As I've said before I usually try to use up one hand cream before I start a new one, but when this popped up in my most recent Glossybox and I noticed that it was a hand balm rather than a hand cream, I couldn't resist starting it to see what it was like. There's not much information on the tube, well there's a little bit but it's in German and although I have GCSE German that was a long time ago and I wasn't that good at it at the time! But the English on the front informs me that this contains White Lotus and Ginkgo Biloba. Is it just me or does the second ingredient sound like something out of Lord of the rings (not that I've read it!)? As a balm this is a lot thicker than a cream and at first you can really feel this; until it warms up from the heat from your hands it's quite difficult to spread around. As a balm I find it more moisturising than a cream, which I wouldn't normally be to bothered about as my hands aren't usually dry, but at the moment they are (probably because I keep forgetting to use hand cream) so the extra moisture is welcome. There's not really very much of a scent to speak of but there may be just a slight fresh floral smell. Although it doesn't last for too long it does leave my hands feeling slightly greasy for a little while after I've applied it so I tend to use this just before going to bed when it doesn't really matter too much as I won't be touching anything other than the bedsheets. I haven't given it a try yet but I'd love to try applying a good amount and then popping on my cotton gloves before going to bed. If you have dry hands I'd definitely recommend giving this a try. Have you tried any other Rituals products you'd recommend?